From MK in Widcombe, Bath: I found my senior's two hour session with Simi most instructive at a pace that I could absorb and remember. I can now use my photo library with confidence. Excellent value for money. We often give advice to people about buying a computer. 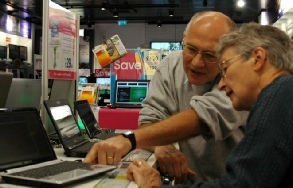 Here’s Tom taking a client shopping, ensuring that she only bought what she needed and wanted, and got value for money.